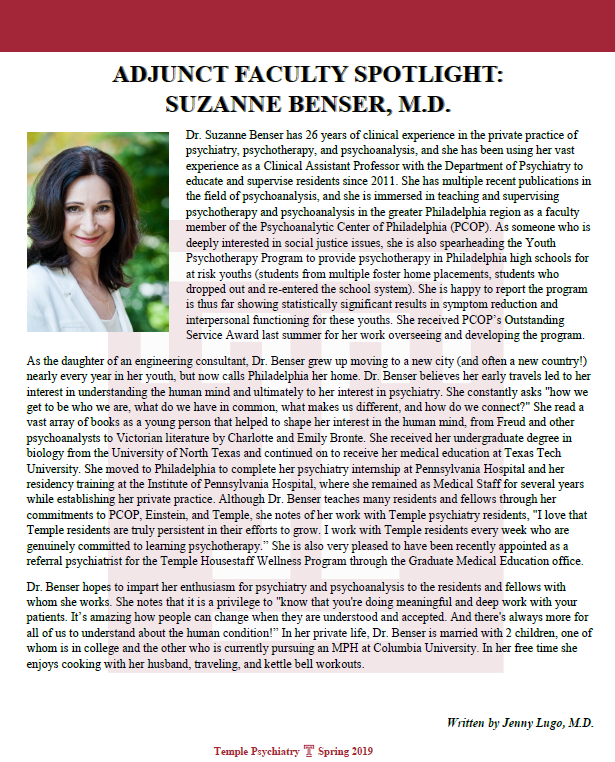 The Spring 2019 Temple University Department of Psychiatry newsletter featured our very own Suzanne Benser, MD, in its “Adjunct Faculty Spotlight.” Written by Jenny Lugo, MD, the article explores Dr. Benser’s professional life as well as her many interests. Click here to read the newsletter in its entirety. Kilian Fritsch, PhD, will be leading a group discussion at the upcoming annual meeting of the American Family Therapy Academy in Austin, June 20-June 22. The topic will be Dr. Tommy Curry's provocative book, The Man-Not: Race, Class, Genre and the Dilemmas of Black Manhood. He will be joined by Dr. Curry, Professor of Philosophy and Africana studies at Texas A&M University, and Andrea Farnham, a doctoral student from the University of Georgia. Dr. Curry has proposed that in our society, "Black men are not men at all; they are sexualized as animal and nonhuman, .. and made Not-Man through violence and death." We hope to stimulate a discussion about how we think about, respond to, and interact with black males in our work, our lives, and our private worlds. Margaret Peterson, PhD, published an essay with Public Seminar (an online journal out of the New School for Social Research). It is entitled “Were We There to Talk about AIDS, or Not? One Woman's Journey in Psychotherapy.” Read the article here. Salman Akhtar, MD, has given psychoanalytic talks in Helsinki, New Delhi, and Istanbul over the past few months. Additionally, since January 2018, he has published five books including the (1) solo-authored Mind, Culture, and Global Unrest and Freshness of the Child; (2) the edited Before and After Violence; and (3) the co-edited Jealousy and the Textbook of Applied Psychoanalysis. Annarita Gentile, MSS, placed first in The Perkins Center for the Arts Gallery show called Photography 37. As a result of winning, her portfolio will be featured at one of the Perkins Center Galleries in 2019. In this portfolio titled “There is more here than you can see”, her images of Philadelphia are evocative in their intense tones and complex representations of the city. The dates and location of her show in 2019 will be announced in the future. Kluft, R. P. (2018). Reconsidering hypnosis and psychoanalysis: Toward creating a context for understanding. American Journal of Clinical Hypnosis, 60(3), 201–215. Richard P. Kluft (2018). Freud’s Rejection of Hypnosis, Part I: The Genesis of a Rift. American Journal of Clinical Hypnosis, 60:4, 307-323. Richard P. Kluft (2018). Freud’s Rejection of Hypnosis, Part II: The Perpetuation of a Rift. American Journal of Clinical Hypnosis, 60:4, 324-347. Richard F. Summers, MD, was re-elected as Trustee-at-Large on the Board of Trustees of the American Psychiatric Association. Ilene Dyller, PhD, and N. Scott Stehle, MD, recently graduated from the Adult Psychoanalytic Psychotherapy Program. Both are involved in center activities. Ilene teaches classes in both the psychoanalytic and psychotherapy programs. Scott is currently volunteering as the Treasurer Elect. Congratulations on to both Ilene and Scott on their graduation and thank you both for your commitment to serving the PCOP community! Annarita Gentile, MSS: Two of Annarita's photographs were chosen to be in the Photograph 37 show at the Perkins Center for the Arts. The show runs from 2/3/18- 3/26/18. Perkins Center for the Arts is located on 395 Kings Highway in Moorestown, NJ. They chose “Pawn” and "Lukoil”. This is Perkins' 37th Annual Photographic exhibition, which exemplifies the best and most innovative work by photographers from throughout the Mid-Atlantic region and beyond. Bram, A.D., & Yalof, J. (2018). Two contemporary Rorschach systems: Views of two experienced Rorschachers on the CS and R-PAS. Journal of Projective Psychology & Mental Health, 25, 35-43. If you are a PCOP member and want to share an accomplishment (awards and publications) with the PCOP community, please email Ariel Slotter by the end of each month. This page will be updated the first week of every month with new member announcements.